Open water trolling is definitely one of the most beautiful and fascinating techniques. Fishing where the sea is cobalt blue and the mainland can’t be seen in the distance is truly a unique experience. 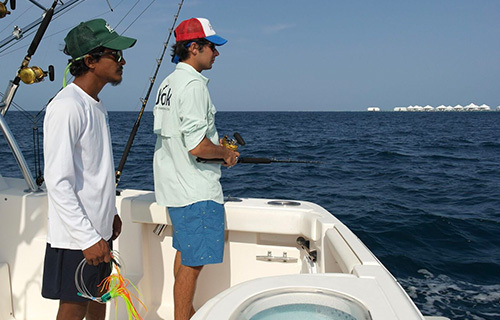 An exciting adventure into the unknown awaits you with this possible catches: Sailfish, Blue and Black Marlin, Yellowfin Tuna, Dogtooth Tuna, Dorado, Wahoo, several types of tuna & barrier fish. Other than flats fishing provides with ours Hewes Redfisher 18F Flats & Bay boats Jack Fly Fishing Lodge Maldives counts on one Big game Fisherman Boat by Tiara & a Center Console 26 feet to provide our anglers the possibility for Blue Water Fishing, Fly Fishing, Jigging & convention tackle. The number of rods that can be used varies from 4 to 8, however, more can be added for you if you request. 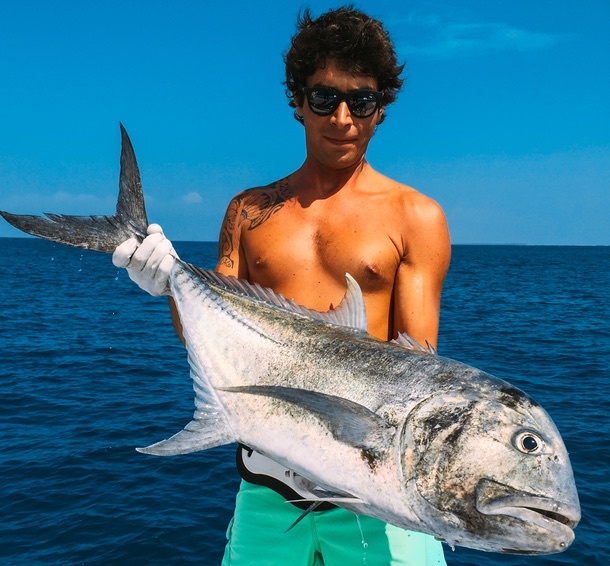 The lures will be, surface, as feathers and kona head, others, sinking, for example, minnow, rapala and bonita are sent down close of the sudden change of depth that generate strong currents. We also use some recalls on the surface and below; these are called teasers, that simulate the activity of the presence of bait fish. 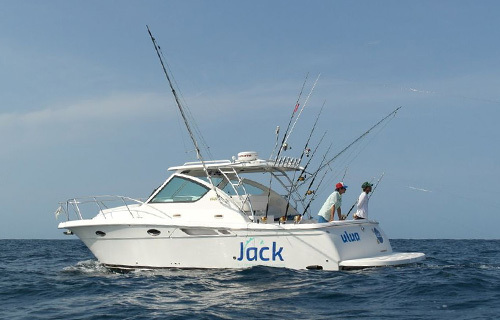 Live bait trolling will be your chance to catch big Groupers, Yellowfin and Dogtooth Tuna, Sailfish and Marlin. Trolling speed varies from 7 to 10 knots. When fish start to attack the baits, sing the reels, the fun will begins! Spinning is a much sought-after technique around the world by fishermens: it consists to trow lures as far as possible and recovering it trying to move it so that it may look like a real fish to arouse the attack of a predator. This technique is practiced on reefs and tuna frenzy. GT’s, Bluefin Trevally, Dogtooth Tuna, Yellowfin Tuna, Grouper, Barracuda, Snapper, Kingfish and many other species of reef and pelagic fishes. The tropical spinning lures are many, there are lures that have the function of emitting vibrations through small spheres inside, others like poppers, have the function of splashing top water, others, like stickbaits still move under one feet of water. It's always good to try out many different shapes and colors, based on the results obtained, trigger the ones that has produced more success, our guides will suggests you on your choice. Personally advice, after buying the lures, replace anchors or hooks mounted with other reinforced. Vertical Jigging is a very special fishing technique: it consists of dropping on the bottom the metal jig, and retrieve vertically by alternating short and long or fast and slow jerking movements. 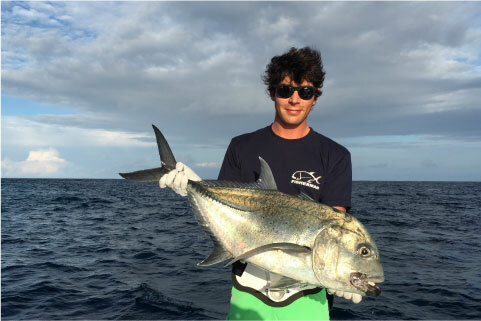 The most exciting part of this technique is cenrtainly the moment when the fish violently attacks the jig, for predatory activity or defense of the territory: Dogtooth Tuna, GT’s, Yellowfin Tuna, Grouper, Snapper & deep water fishes.